Commissioning me or ordering from me acknowledges that you have read and agreed to the following Terms of Service. These Terms of Service are subject to change without notice. If there are any huge changes, I will do my best to announce them. If you have any questions about anything you read here, please email me. If you are curious about the status of your order, please contact me. 1. Email is my preferred method for contact and discussing commission information. I normally check emails every day. 2. Sometimes I may not check messages for a few days, so give me time to see and respond to things. I have had problems in the past receiving notifications of messages/notes left for me on various websites, so I strongly suggest contacting me via email. 3. If I don't answer a message or you can't reach me, I am not ignoring you or trying to be rude. Your message or note probably got eaten by gremlins, or I may be having technical difficulties. 4. If you haven’t heard back within a reasonable amount of time, please write me again or try one of the alternate forms of contact I have listed, in case one isn’t working for whatever reason. 1. In order to commission me, send me an email with details about what sort of commission you would like, and indicate what medium or what materials you might want used. - No other correspondence will be accepted for commission related information. I request that you continue to use email as the primary form of contact for the commission. Please make sure to check your email regularly for responses from me. - I will respond with a price estimate based on what you asked for, and we will discuss further details and adjust the price accordingly. All commission prices will be discussed before the work is started. 2. Once approved, I will send an invoice or you will send the agreed upon amount for the commission. Payment is due as immediately as possible. A spot will be reserved for you in the queue for 30 days. If no payment or arrangements have been made by then, I will remove you from the list and you’ll have to reapply if you are still interested. 3. I must receive payment and all reference images and/or descriptions before I begin any work. - Reference sheets are preferred, but I understand not everyone has them. Images done by other artists, written descriptions, and animal/object/clothing/etc image references are also acceptable for examples. If these are not given, I will have to improvise. Please be very clear on what you want. I am not responsible for changing things on a commission later because a customer did not clearly mention it. 4. Please attach ( to your email ) several reference images and / or a brief written description with key details. Please attach rather than link to references, in case websites are down. If you link a reference and I cannot access it, I will not work on your commission until I can access it. 5. I do my best work when I have artistic liberties while creating artwork. Getting references and a description of what you’d like to see, to guide me in a general direction, is great. I have a very strong sense of design layout and color usage. The more freedom you are willing to give me, the more impressive the outcome might be. 6. You may choose to ask for progress images, or to have the design be a surprise. I normally confirm details and ask questions as I work, but I also try to be vague about it for customers who want to be surprised. - For traditional and digital drawings, paintings, etc. I share the finished sketch to allow you to make necessary changes before I ink or color. I'm happy to make desired changes to the sketch, within reason. There may be additional charges depending on complexity and number of changes. - For sculptures, jewelry, or other traditional media work, I may share an image of the rough design or stones, etc. that I plan to use. Sometimes these things are harder to offer progress images for because of the nature of how they are created, and changes may not always be possible after certain points in their creation. 7. I have a talent for making unique things, and I have developed my own style and creative process over the years. My style varies depending on what mediums I use and how I choose to work with them. Please look through my galleries before you commission me so you have an idea of what to expect. 8. If you like the things I create, and wish to help by supporting my artistic efforts, tips and donations are always greatly appreciated and accepted. If I am uncomfortable with the subject material you're asking for, there may be an additional charge. I reserve the right to decline your request if it is something I do not wish to portray. I will be nice about it, so don't be afraid to ask, but there are certain things I will not do. 1 . The customer must allow me adequate time to finish the requested commission if the customer desires a deadline. - Depending on complexity, some commissions can take upwards of 30 days to complete ( normally less ), depending on other commissions I have pending, etc. 2. Unless I am told there is a specific date that an order or commission must be completed by, I will assume there is not one. Orders will be completed and shipped in the order they are paid for. 3. There will be an additional charge for rush orders with deadlines that do not allow me adequate time to complete the artwork. - These orders will have to be bumped ahead in the queue and must be paid in full before I will move them up in the to-do list. ** Please note - Processing time for orders may vary depending on a variety of factors - How soon the order is paid for in full, the order's complexity, time for ordering and shipping of materials I may need for the commission, how fast I can complete the commission, and any downtime I have to take due to work, health issues, or life events. 1. Prices are subject to change. Unless otherwise noted, prices listed are base prices. 2. Payment is accepted through Paypal, debit, or credit. I also have direct checkout options available in my shops. I can take payments in person or over the phone. 3. Under rare circumstance, I may accept certified cashiers checks ( from US banks only, not the same as personal checks ), US postal money orders, or well hidden cash ( inside a card for example ). - The bank has to clear an e-check, a cashiers check, or postal money order - please expect a slightly longer processing time using these methods. 4. I expect full payment for any orders under $50. For orders over $50, I normally expect 50% of the price up front, unless otherwise discussed. 5. A non-refundable deposit will be required for basic material costs if your order requires materials / supplies I need to special order. This is to ensure you are serious and I am not spending money ordering materials I may not otherwise need. 6. No commission work will begin until full payment (for orders under $50) or a deposit (for orders over $50) has been received. 7. I will only send out low resolution, heavily watermarked previews of drawings or paintings in progress until full payment is received. 8. I work on a first come ( first paid ), first served basis. If someone sends me payment before you do, I will start work on and try to finish their order first. 9. Please clearly identify yourself when you make a payment so I can match it to your order. Email me to let me know payment was sent ( *especially* if you snail mail payment, so I know to watch for it ). 10. If you send payment via snail mail and I do not receive it, your order will not be considered "paid". I highly recommend you use delivery or signature confirmation if you decide to send payment this way. I do not reimburse postage. 11. No pre-made artwork ( jewelry, sculptures, etc ) will be altered or shipped until full payment has been received and cleared. 12. I may consider adding these other payment options in the future if there is a demand for it. – Dwolla, WePay, Serve, Alert Pay, Amazon Payments, Google Checkout. 1. I retain all rights to any artwork, images, designs or concepts I create. I reserve the right to use anything I create as I see fit. 2. This includes, but is not limited to, producing and selling prints or portfolios ( print, digital, CD, shirts, etc. ) and posting ( or not posting ) to my website, online galleries, or similar sites I use. I retain full commercial and distribution rights on any artwork, images, designs or concepts I produce. 3. The customer may use the artwork for personal ( non-commercial / non-profit ) purposes only. Only the customer who commissioned the art has permission to use it for icons, role-play images or references. I include a web friendly resolution that I prefer the customer uses. 4. The artwork may not be used for any commercial purposes, including but not limited to: business cards, logos, posters, banners, advertisements, book covers, selling prints, etc. No profit is to be made off the artwork. 5. For artwork portraying a customer’s original characters, credit for those character designs will be given to the customer. The artwork itself remains mine. 6. If you request that I create a special original character concept for you, the credit for character designs will remain mine. 7. Should the customer decide to repost the artwork elsewhere, they must give me full credit for creating the art and link back to the website or gallery where it was originally posted. If uncertain which site to link to, contact me and I will let you know. No alterations can be made to any artwork (adding markings / tattoos, removing signature, re-coloring, etc. ) without my written permission. If some minor thing needs to be changed to a commissioned piece (a missed marking or other feature, etc. ) I am normally happy to help. Depending on the circumstance, there may be a fee involved. I offer commercial usage rights purchase on a case by case basis. I'm willing to try and work something out to fit your budget. Please contact me for details. 1. I ship orders all over the US and worldwide. International customers can contact me for shipping quotes. 2. All items, unless otherwise specified, ship via USPS First-Class or Priority Mail with Delivery Confirmation. Items are securely packaged in a manner appropriate to the contents. I will generally ship within 2-4 business days of your payment being received and clearing. Commissioned items are shipped upon completion of the item, once paid in full. 3. I usually ship Monday through Friday. I cannot ship anything on Saturdays, Sundays or bank holidays. 5. Faster shipping options are available for rush deliveries. Buyers will be responsible for additional charges. Buyers will be invoiced separately for any additional shipping costs. 6. I will happily combine shipping if you purchase multiple items and they are going to the same address. 7. If the customer does not wish to pay shipping for traditional art (including sketches), I have the right to sell the originals by whatever means I wish. 8 Shipping costs cover shipping and handling, as well as packing materials, envelopes, bubble mailers, etc. Shipping costs are determined by destination and weight. Import duties, taxes, custom clearance and other charges are NOT INCLUDED in the item price or shipping charges. These charges are the customer’s responsibility. Please check with your country for any additional rules, regulations, duties or taxes that may apply. I will not be held responsible for any additional fees your country may require to release your package. 1. I have the right to cancel a commission at any time I see fit, or refuse work from any person at any time. 2. I have the right to cancel a commission at any time due to rude, disrespectful or inappropriate behavior, the inability of the customer to clearly communicate what they want, or if the customer is unable to keep in contact during the period of the commission. 3. I may push back deadlines for commissions or need to cancel a commission if I cannot complete it for some unforeseen reason ( medical issues or life events, etc. ). I try and give as much advanced notice as I can if possible. 4. Refunds will be issued on a case by case basis. If the customer would like a refund, a request may be made for one. I will not guarantee I will allow it. If a refund needs to be issued, I will refund the remaining balance of the commission minus work and materials. 5. There are no refunds for completed commission artwork. 1. I am very easy to find online and do my best to keep in contact with all of my customers. I send updates on commission status and I will send reminders if payment is due or if I need additional information. 2. If for some reason I lose contact with a customer who has paid in full, I will normally make several attempts to contact them and give 7-14 days for response. If I do not receive a response, I will stop work on the commission and move it to the end of the list. 3. If I do not receive communication back from a customer within 3 months, I will cancel the commission and keep the payment. 4. At that point, any work-in-progress or completed items may be altered and/or sold however I see fit. Otherwise the items may be recycled for materials. Unused materials will be returned to my supply inventory. 5. No refunds or credit will be given for cancelled commissions due to a lack of communication. 1. Please contact me within 7 days of receiving your order if there are any issues with it. After 7 days, all sales are final. 2. Contact me before leaving feedback, and I will do my best to resolve any issues. I want you to be happy with your purchase, but I can't help make it right if I don't know about it. 3. I will do my best to exchange or replace your order depending on the circumstance. Replacement/exchange depends upon what supplies I have in stock and whether I will be able to recreate your item, or something like it. 4. If insured packages arrive damaged, please take pictures of the packaging and contents and send them to me. Retain all packaging as proof for the shipping carrier, in order for an insurance claim to be filed. This will be necessary to get a refund for damaged goods. 1. 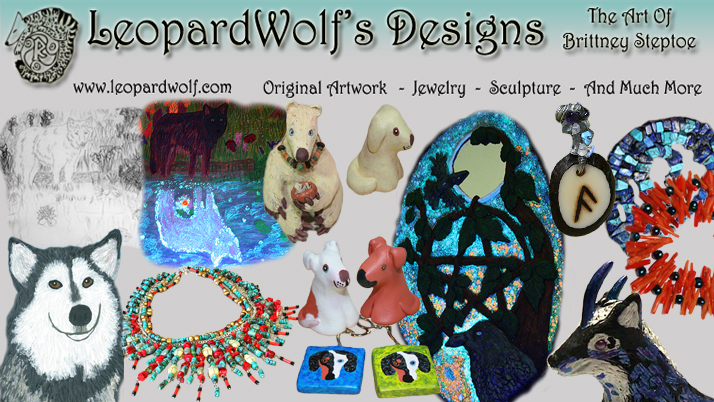 Items must be pre-made pieces of artwork such as jewelry, sculpture, or other traditional media work. 2. Items cannot be personalized to resemble a customer’s characters or any special symbols, glyphs, etc. that belong to the customer. Items must be something that could be re-sold to anyone. 3. In most cases, character commission items cannot be returned, but most jewelry items and some sculptures may be eligible. Earrings *cannot* be returned due to sanitary concerns. 4. Items must be in original sales condition, with no missing parts, and not damaged or altered in any way. 5. Shipping and handling is not refunded. The buyer is responsible for return shipping cost. 6. After I receive the returned item and verify its condition, I will issue a credit for the value of the item (minus shipping, handling, and insurance costs). 1. Credit may be used to purchase other items or toward commissions. Some restrictions may apply. 2. All credit is valid for 90 days. After 90 days, credit is null and void and will not be accepted. 3. Credit cannot be used for covering shipping costs. Sometimes accidents happen and things get damaged over time. If your item should need repairing, please let me know. I would be happy to help when possible! I also offer minor repair services for some types of jewelry. I have been trusted with many heirlooms and one of a kind items over the years, and always take the greatest care with them. Please contact me for more information. Occasionally I offer sales and special promotions. I also offer discounts in certain situations. This is on a case by case basis, and has no set discount amount or percentage. I have sometimes been known to include surprises in orders. Thank you for taking the time to read the Terms Of Service. If you have any questions, concerns, need clarification, or need help with your order, please contact me.